Karen Lynn Parrish passed away Saturday, October 17, 2015 at home in Overland Park, KS surrounded by her family and friends. Karen leaves to cherish her memories her loving husband, Lynn Parrish; three children and their spouses: Kim (Rob) Brune, Ryan (Sayard) Parrish and Joshua (Stefanie) Parrish; nine grandchildren: Carter and Caden Yancey, Vinsen, Roman, and Gemma Parrish, Bennett and Elyse Parrish, Megan and Mallory Brune; her parents: Elmer and Betty Whitesell of Lincoln, NE; two brothers: Michael Whitesell of Lincoln, NE and Steven (Mickey) Whitesell of Pensacola, FL; and many, many friends, co-workers, aunts, cousins, nieces and nephews. Karen was born September 5th, 1948 in Omaha, NE. She grew up in Norwalk, CA and Lincoln, NE and graduated from Lincoln Southeast High School. She met her husband Lynn at the University of Wyoming in Laramie, WY. She followed Lynn’s career moves to Richmond, VA in 1972 and to Johnson County, KS in 1980 where they have resided since. Karen earned her Bachelor’s Degree in Education at the University of Missouri at Kansas City and her Master’s Degree in Education at Webster University. She was an elementary school teacher in both the Turner and Olathe School Districts and later supervised student teachers from Kansas State University. Karen was a strong proponent of public education. She actively participated in the Professional Development School (PDS) Partnerships between the University of Kansas and Turner Elementary School and between Kansas State University and the various school districts in Johnson and Wyandotte Counties. She presented the KU PDS Teaching Model at the Third Annual China-US Conference on Education, Phoenix, AZ in April 1999. She also presented the Model at the Learning Exchange Whole Language Conference, the Kaw Valley District Conference and at various local, state and national PDS conferences. She was a member of the Kansas University PDS (KUPDS) Executive Council for five years and represented the University of Kansas at an Eisenhower Grant Conference conducted by the US Department of Education, Washington, DC. She also served as an Adjunct Faculty Member at the University of Kansas, Lawrence, KS (1997) and collaborated with a team of PDS educators in planning and implementing an undergraduate education course. Karen was a devoted wife, mother, “Gram”, friend and teacher. She loved to work with children and for a number of years taught swimming lessons for Johnson County Parks and Recreation and for the City of Lenexa Parks and Recreation. She served as an elementary school room mother and was involved with Cub Scouts, Brownies, and Girl Scouts and provided fan support for the many sports activities of her three children. For several years she taught Sunday school and volunteered in the nursery at church. Her passions included spending time with family, playing with grandkids and watching their sporting events. She loved to travel, especially to any beach, anywhere. She enjoyed hiking in the desert near Scottsdale, AZ and in the Rocky Mountains. 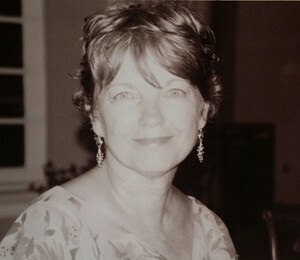 She was an avid reader and gardener and was a member of Grace United Methodist Church. The family will receive friends for a visitation from 5:00 - 7:00 pm on Thursday, October 22nd, at Grace United Methodist Church, 11485 S Ridgeview Rd in Olathe, followed by a Celebration of Life at 7:00 pm. In lieu of flowers, memorial contributions may be made to Center of Grace, 520 S Harrison, Olathe, KS 66061 (online at graceumc.church). The family would like to express their gratitude to the staff at the University of Kansas Cancer Center-Westwood Campus. To leave a special message for the family or to share a memory of Karen, please click on the "Share Memories" tab above. Add your memories to the guest book of Karen Parrish. Lynn and Family, our thoughts and prayers are with you during this trying time and may our prayers serve as comfort to you. Remember the good times you had together. She touched so many lives, she will be missed. Dear Lynn and family: I send condolence on your loss. Such a wonderful, fulfilled life, however, will be a source of many memories which hopefully will bring some mitigation of your sorrow. My hope is for that comfort. Lynn and Family, I am very sad to hear of your loss. I hope that in this sad time, your grief is lightened just a little in hearing from so may people who were touched by Karen. What a wonderful testimony she is to Christ's calling. So sorry to hear about your loss of your lovely wife. Please know that our thoughts and prayers are with you and your family. Our thoughts and prayers are with you and your family at this time. May God wrap you in His arms and give you peace. Karen mattered to so many people. She was just one of those wise & gifted souls, who made a difference, in the lives of those who's path she crossed. The many years we lived across the street from Karen, Lynn, Ryan, Kim and Josh, were the best of times, that I will always cherish. Before she "officially," became a teacher, she had already taught me so many life lessons, by her example. Thirty years ago, she walked across the street and shared her recipe for zucchini muffins with me. And so, because of her, a family tradition was started. Not a summer has gone by, that my family and friends arn't given Karen's zucchini muffins! On the outside we saw, her remarkable blue eyes, her graceful hands, and the best smile ever. But it was her, faith,kindness, intellect, wisdom, and self awareness, that really caused one to pay attention and heed to what she had to say. Kim, I used to babysit for Vicky across the street from you. I know we met a few times. Vicky called me the other day and told me your mom passed away. I'm sorry to hear this and am thinking of you and your entire family. Karen was a true blessing to me. She encouraged me as a professional but more importantly, as a friend. She kept me looking forward with hope to healing in my relationship with my daughter through a very tumultuous time. Her quiet spirit modeled strength and peace. One of my memories is walking into her classroom while she was listening to the radio and working in her classroom. The song this particular day was " I can only imagine..." She now is face to face. I am so thankful for her life. Am so sorry to hear about your loss. I worked with Lynn years ago and his commitment to family was always easy to see! I'm so sorry to hear of your loss. Please know that your work colleauges thoughts and prayers are with you and your family. Karen was a dear friend and always so self-less. Even in her pain she put everyone else before herself. You would never ever know she was hurting and always asked what she could do for you. Her friendship and care meant the world to me, so thank you so much for sharing her with us all. She was a true child of God and blessing to me. Lynn, you are in the thoughts and prayers of your IRS family. May God bless and strengthen you during this difficult time.